We've been in our home for a little over one year and my "to-do" list of house projects is still a mile long. 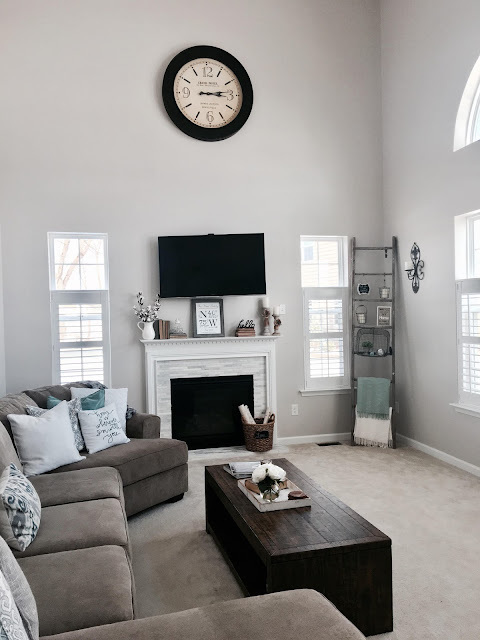 We built our home and as much as I love being the first occupants of it, sometimes I feel like it lacks character (can you say cookie-cutter?) I try to bring in character wherever I can, which typically results in me making trips to the antique store. This can be dangerous as I am like a kid in a candy shop when antique shopping...more on that another time. 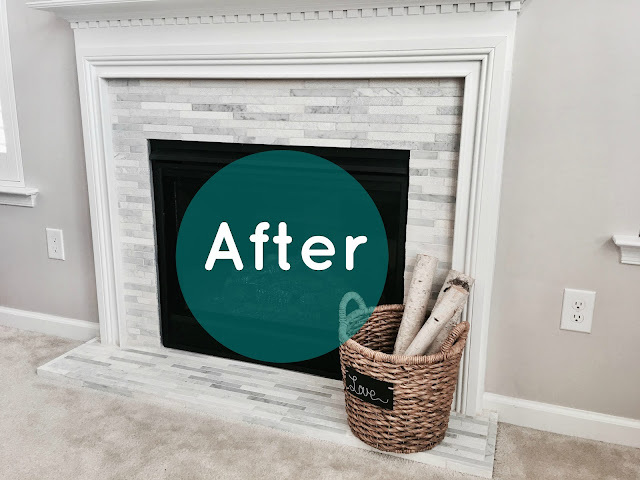 One of the projects that's been on my list is to makeover the fireplace. 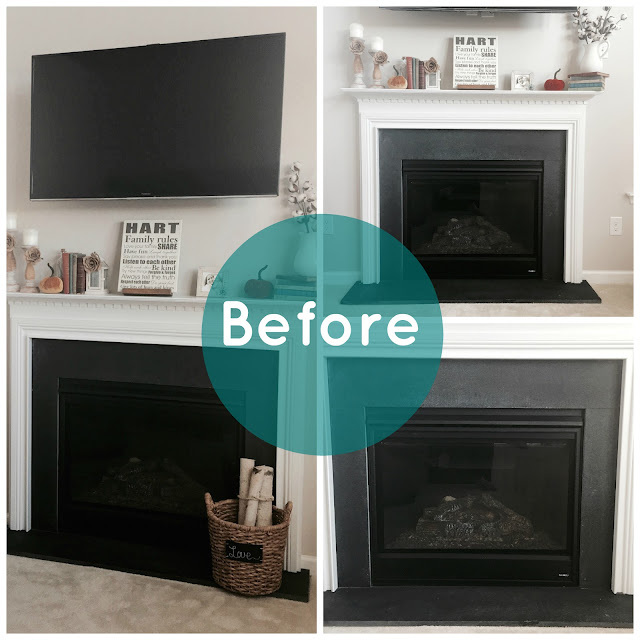 The fireplace is the focal point of our living room. 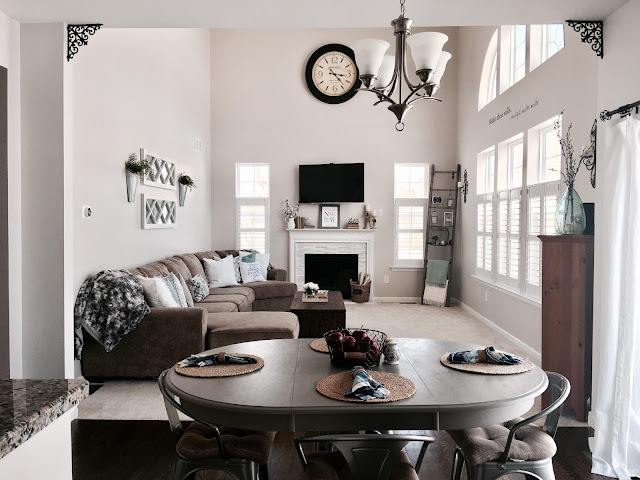 On either side of it we added custom windows to compliment the series of windows on the adjacent wall and of course to bring in more natural light. As the months have gone by I found myself often making comments about the black slate surrounding the fireplace. 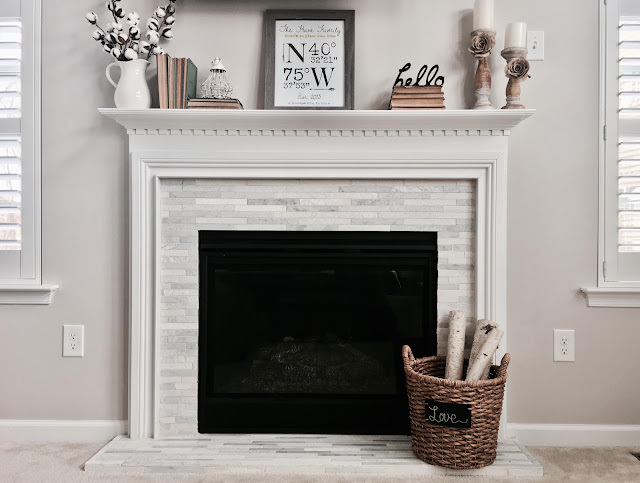 During the winter months we barely used the fireplace and yet the slate looked faded and worn. A few Pinterest pins later for some inspiration and we were dropping the kids of with their Gigi and heading to every new homeowners favorite place to go on the weekend, Home Depot. Without following anything specific, we browsed the aisles of tile. I knew I wanted something bright, white and if it incorporated marble I was sold. After about an hour we had our tile. We went with a tile called Dove Prairie Mosaic. The combination offered a little bit of everything that I wanted and the tiles varied in texture...remember what I said earlier about character? We grabbed a few more items needed to lay the tile including a tile cutter and headed home to start our project. Side note: This project was completed a few days after my miscarriage (yes it's taken me four months to finally post it). Since I was still physically recovering with lots of back discomfort, Sean did all the manual labor. This was his first time laying tile and he did an amazing job. The project took two days to complete. This project came together so perfectly. Exactly what I envisioned. Hi friend, welcome to my blog! I'm Amy, wife to my college sweetheart Sean, mama to our 3 littles Mason, Emory and Jolie and fur mama to our lab Maggie. Follow along as I write about life as I know it from my "hart" to yours!